I first met James Fox about eleven years ago while he was filming his documentary Out of The Blue; he wanted to interview me regarding my sighting of a massive V shaped object seen at 8:30 pm, Thursday evening March 13, 1997 (now erroneously labeled as The Phoenix Lights). I was immediately impressed with James, as he allowed me to speak openly about my sighting and was asking the right questions. He was the first producer in my experience that was truly interested in what witnesses had to say. Out of the Blue was and still is the best UFO documentary by far, in my opinion. In contrast to the norm—it was/is a serious, informative and educational presentation and has been a constructive shot in the arm for Ufology, enlightening the public about the ongoing phenomenon. I’m very proud to have played a small part in the making of this ground-breaking show; to be included with such high caliber witnesses as former presidents of the United States, high profile military personnel, astronauts/cosmonauts, and various high ranking government officials—I was truly honored to “make the cut”. James Fox not only acquired my admiration, both personally and professionally, he garnered the respect of the majority of the (so-called) UFO community via his work with Out of The Blue. Little did we know—he was just getting started. Another crowning achievement by James (along with Leslie Kean) with equal impact to Ufology, was putting together a press conference at the National Press Club in Washington, D.C., on Monday November 12, 2007. The event showcased high ranking government officials, aviation and military pilots from all over the world, thus allowing them a public platform to share their respective UFO experiences that were realized in their “official” capacities. This stalwart effort in part to get the US government to open the files on the UFO subject (public disclosure) gets high praise from me. Again, the “press conference” was yet another stepping stone for James, as that work culminated in his next impressive, widely acclaimed documentary I Know What I Saw. This film compiled the testimony from those at the press conference and expounded upon it, by adding additional high caliber witnesses and evidence. Indeed, a major accomplishment, James. Both Out of the Blue and I Know What I Saw will go down as two of the best UFO documentaries of our time; two topnotch films by the best UFO documentary producer—James Fox. I deemed it necessary and important to recount James’ previous accomplishments in film generally and Ufology specifically, as this editorial was precipitated by the new show Chasing UFOs, as seen on the National Geographic channel. Chasing UFO’s is not a James Fox production; in this series, I consider James an actor (and I use the term loosely). With that in mind, I would like to say that I, as well as many others waited with great anticipation for the series to premier a few weeks ago. I was truly hoping for the best. And as we all “now” know—we got the worst! I didn’t think anything could be worse than UFO Hunters, but I was wrong! Since my life-changing experience on March 13th, 1997, I’ve been heavily involved in this thing we call Ufology; I don’t label myself a Ufologist (although others have and do), I consider myself a very fortunate individual, a witness to a once in a life-time event. In that vein I initially sought out other witnesses to the (so-called) Phoenix lights event and later witnesses to UFO events in general. Thus, because of my experience and personal quest, I have met many, many witnesses, Ufologists, enthusiasts etc., participated in dozens and dozens of TV and radio shows. With such high quality productions afforded by James Fox in the past, and after watching the first four episodes of Chasing UFOs, I can only ask (James)—what were you thinking?! James, as your friend, you are awesome behind the camera. You are a film producer. Not a reality show actor. You have done so many great things for Ufology with your films. Please stay behind the camera, and don’t sully yourself with kind of nonsense. I believe Chasing UFOs should be animated and sold to the Cartoon Network. 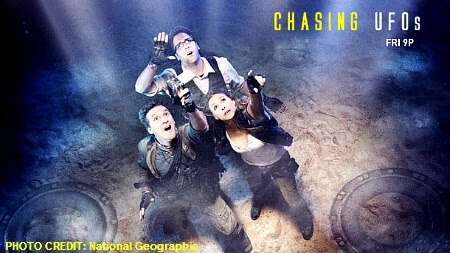 Mike, your review of Chasing UFOs and James's role in it, is very well written. I appreciate your citing of his previous accomplishments and I especially agree with your comment on the improper name that is given to the event that occurred in Phoenix.